Debugging an application in a traditional ASP application has always been somewhat difficult. Although you could step through all the source code with a debugger, there was no way to see results in real time (enable tracing) without the strategic placement of ‘Response.Write’ commands throughout your code, and cluttering your output with the Response.Write results. Unfortunately, you had to go back and remove all these statements before releasing the application into production. There was no easy way to implement a switch and turn tracing on and off. ASP.Net has changed this process by giving us an elegant alternative to the ‘Response.Write’ solution traditional ASP programmers use. With .NET, you do have a switch which can turn tracing on and off. There are two levels of trace information in ASP.NET: page-level and application-level. Size (in bytes) required to render the page, and each control. All server variables (REMOTE_HOST, SERVER_NAME, etc). To produce these tracing results, a new @ Page directive for the form is shown below. TraceMode is an optional parameter. The SortByTime value instructs the runtime to sort trace messages based on the time they arrived, while SortByCategory sorts the messages by the category name. 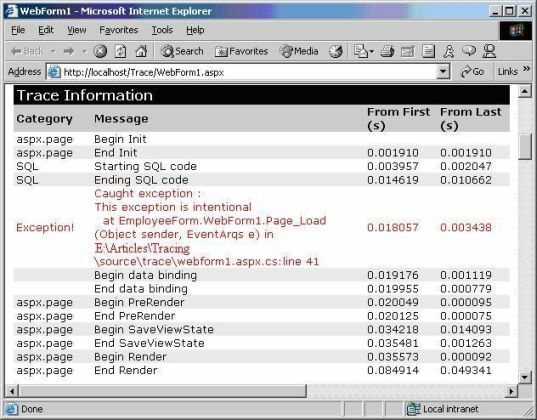 ASP.NET provides default trace messages with a category of aspx.page. You can instrument your own code using the Trace property of the Page object. The Trace property is an instance of the TraceContext class, whose member methods Write and Warn place time-stamped custom trace information into the trace log. Using Warn will cause the trace log entry to appear in red instead of black. Also, if you want to avoid expensive calculations in producing trace messages when tracing is not in effect, check the IsEnabled property on the Trace object. In our employee report web form, we could add the following statements to the Page_Load method. Each trace method offers three overloaded versions. The simplest call passes just a trace message as an argument, while the most detailed call allows you to pass a category string, a message, and an exception to dump into the trace log. The most common usage is to pass just a category name and a message. The above code produces the following output. To enable tracing for an entire application we need to modify the trace section of the web.config file. Not only does this allow the runtime to log trace messages from every page in the application, it also enables a trace viewer (trace.axd) in the application’s root directory. The trace viewer output for our example application is shown below. From the trace.axd view you can drill down into the individual trace logs for each request. The number of trace logs kept for viewing, and other parameters, are controlled by the attributes in the web.config file. The trace section for this application is shown below.